ACT! Premium Cloud : access to ACT! from anywhere through the Web from 2 users. With our Global Web Access solution for ACT! you access your basic ACT! from anywhere, anytime with an Internet connection from your Windows PC, Mac, or even your iPhone or iPad, by freeing you of the installation process or sync ACT!. Global Web Access for ACT! is the solution that allows you to access your data from anywhere in real time via a simple Internet connection (ADSL or 3G connection). No need to have the application installed on your computer and synchronize your PC permanently. You can be sure you and your teams work in real time on the same customer base updated continuously. 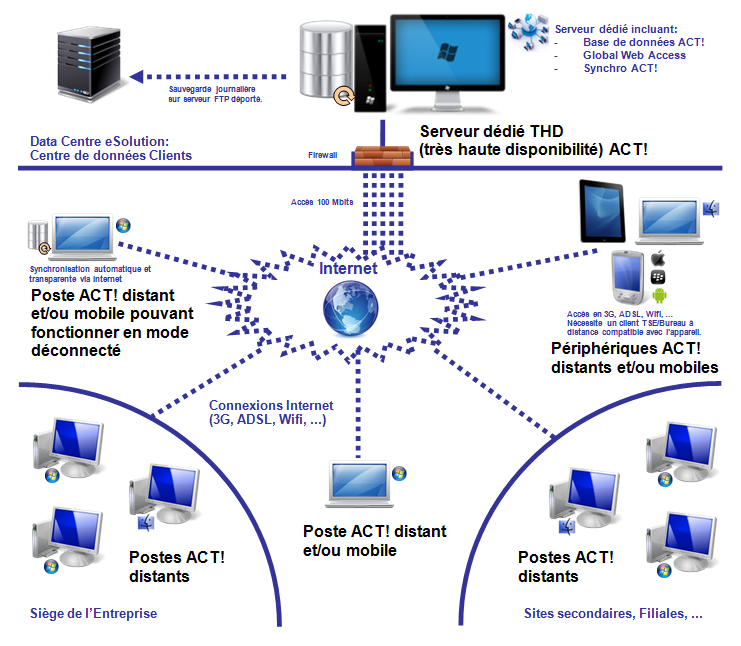 Global Web Access for ACT! offers enhanced security since it avoids the user having to store its data on his computer. Your company has a server dedicated to ACT!, Hosted at home or in our data center and allowing you to update your valuable customer information centrally. Here is an example of architecture, showing you the complete solution, hosted in our data center (via leasing a dedicated server). However, you can purchase the solution Global Web Access for ACT! and deploy your own server. 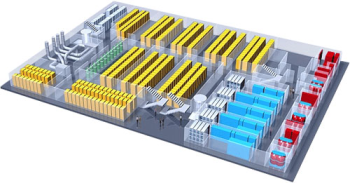 You can also discover our high performance data center through this 3D presentation. * It ensures total security of your data on your server. This data is protected behind a firewall and exchange are secured by an appropriate encoding. * You increase your opportunities, boosts productivity and helps you focus on the essential, having a secure remote connection to ACT! and other Windows applications via the Web. * It reduces costs and increases your efficiency by centralizing your administrative tools and allowing everyone to focus on its contacts. * It allows you to access your data in real time through a centralized database, eliminating lead times, loss of information and synchronization. * Finally, it gives your users an easy remote connection without installation. 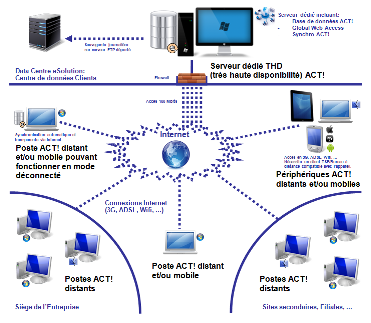 Why use Global Web Access for ACT! ? * To make available to your staff the new features in ACT! having only one computer to update: your server. * To continue to use your IT infrastructure without having to question or to upgrade. * To support the use of multiple operating systems (Windows, Mac, Linux ...). * To replace Mechanisms sync ACT! by a real-time access to data. * To connect over a LAN, Internet or other remote connection. Need more informations ? Do not hesitate, just	contact us.